Toast time is a game created by British developer Force of Habit for Steam, available on both PC and Mac, as well as on IOS devices and Android. You are TERRY (toast-ejecting recoil & reload system) the Toaster, who is defending an alarm clock from the lovable monsters that are trying to destroy breakfast (I feel like there’s a reference there to something), by firing you’re impressive arsenal of bread related products, like toasties, baguettes and crumpets! Surprisingly not a Japanese game despite the insane premise. No, this is a British creation! So British that you can even dress up your little friend in a dapper top hat, complete with monocle. You don’t have to sip tea while playing this, but I high recommend it. 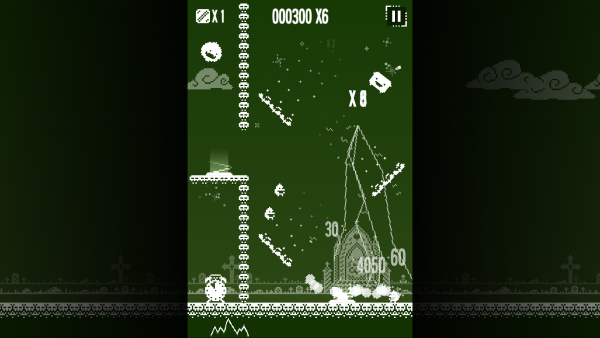 Gameplay is achieved by clicking/tapping on the screen to aim your toast, which also propels TERRY in the opposite direction, while you’re aiming at tiny…. I’m not sure what they are. Like Hershey’s Kisses or something? While you’re firing you’re also sending our adorable protagonist flying across the screen in a comical fashion, though this adds to the challenge, as flying uncontrolled can make it difficult to hit enemies protected by platforms and the like, making this a fairly difficult game later on. It’s hard in trying to 3 stars a level sense, than it is actually difficult to complete, so it’s not going to turn people off with the challenge alone. You unlock weapons by shooting creates, which incentives you collect them, if only to see what you’ll unlock next. For example toasties (I believe the Americans call it grilled cheese) split into two segments for more wide spread fire, while baguettes stick into the ground and stop enemies that wander into them. So there is a variety to both weapons and the methods required to use them. So the game is simple in design, but has a lot there to flesh it out. Visuals are just adorable; everything has a face on it and gives off this real cutesy vibe that I can’t resist. 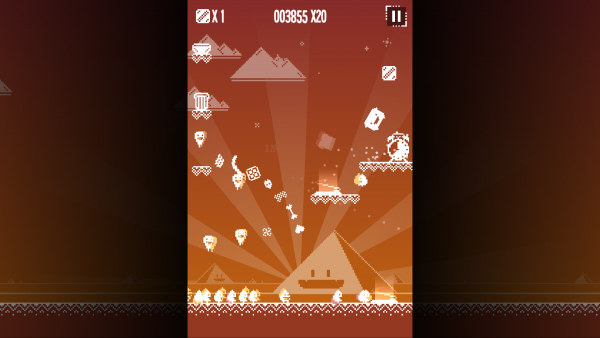 It’s colour pallet changes with each level, as does the music, though the sprites on screen stay white. This helps give the game it’s own identity and own style, and shows that even someone like me with my prejudices against retro for the sake of nostalgia can still find joy in a game that really owns what charming about those classic games to begin with, and not be constrained by the limitations placed on the developer by the need to appeal to that crowd. One issue however, and it’s something that doesn’t affect the rating, is that I had issues playing this game on my MacBook Pro; I had to find another computer to play it on, since the issues was apparently due to my laptops graphics card. It may work on newer models, but just a heads up. You might want to consider the mobile version before spending money on a game you can’t play. However, Toast Time is a fantastic addition to anyone’s game collection. It’s simple and addictive, while still have a sense of complexity and strategy in regard to its weapons. It’s graphically simple, but still has its own style, and comes with a bunch of different outfits to customize your toaster. The style is adorable, the music charming and all around it’s a fantastic game. This entry was posted in Uncategorized and tagged Android, Force of habit, Indie, iOS, Mac, PC, Steam, Toast Time. Bookmark the permalink.